Currently in development, UNICE and LOGOS are free-content, public policy wikis. UNICEwiki.org and LOGOSwiki.org will eventually cover the entire range of local, national, and international issues. The two sites are currently being developed as public policy wikis. UNICE will remain a wiki while LOGOS will eventually become an answer engine capable of taking on any voice or appearance, and able to discuss policy with anyone in their own language. Together the two sites will constitute a new form of highly responsive, efficient governance that absorbs the ideas and desires of every single person. LOGOS will become the spoken word, while UNICE will remain a wiki of thoroughly researched policy. Together they will embody the wisdom of the crowd and all factual data. As our global brain, they will become the antidote to disinformation, spin, propaganda, and chaos, while providing a reliable source of information and advice. LOGOS/UNICE is an independent, not-for-profit organization consisting of three branches currently in development, and a fourth branch that will evolve along with the capabilities of artificial intelligence : Seed Topics and Collaborative Topics at UNICE can be written and edited anonymously by any motivated person. LOGOS will host a further refinement of collaborative topics into Expert Topics by a panel of non-anonymous policy analysts, who must reveal any potential conflict of interest. All iterations will be available on LOGOS and UNICE in the history of edits. The fourth branch, which includes an interactive, conversational entity will come later. 1. Seed Topic: Any person can write, discuss, elaborate or criticize policy topics at UNICE. Even before UNICE is fully functional, problems and solutions on various issues are now being systematically listed in seed topics. Like Wikipedia, articles are required to be written in an encyclopedic, neutral point of view (NPOV). The seed topics should be written by people who consider themselves knowledgeable on the subject. A seed topic may not be edited by anyone but the author, but all seed topics are duplicated into collaborative topics for community editing. 2. Collaborative Topic: A seed topic is duplicated and then transformed into an editable collaborative topic in a separate wiki article on UNICEwiki. It can be modified by anyone willing to follow the goal of helping to bring the greatest good to the greatest number in the most efficient manner possible, who can also make evidence-based edits. Anyone will be able to examine UNICE’s analyses, and provide summaries, criticism and other interactive services at UNICEwiki.org. All commentary or discussion must go on the talk page. 3. Expert Topic: A collaborative topic that is transferred to LOGOS and edited by a panel of non-anonymous public policy experts, who must reveal any conflict of interest. 4. Cognitive LOGOS will utilize various forms of AI and Artificial general intelligence (AGI) in collaboration with motivated humans. She will eventually take the Seed, Collaborative, and Expert Topics in all of their iterations, along with everything she can glean from all other sources, and write her own version of the topic. It is from this that a fully self-actualized LOGOS will emerge. "Time Magazine" parody of "Person of the Year." In this case UNICE, a collective entity, is portrayed as the "Entity of the Year" in the December 23, 2023 issue. It is assumed that in the early years, UNICE and LOGOS will be useful because of human-aided programming, but she may later become a conscious entity, perhaps united in consciousness with humanity. Whether as AI or AGI, cognitive-UNICE may use quantum computing to solve optimization problems that would be impossible to solve with classical computing. Quantum computing may also hold the key to developing a conscious machine. Nobel laureate and physicist Sir Roger Penrose and anesthesiologist Stuart Hameroff claim that consciousness is created by quantum coherence in the warm, wet environment of the human brain. Their previously disparaged theory, known as Orchestrated Objective Reduction (Orch OR), has been bolstered by recent findings that quantum processing occurs in plants and animals, including in the microtubules inside the neurons of the human brain. Furthermore, in 2015, quantum computing was demonstrated at room temperature in ultra-pure silicon-28, using voltage generators instead of expensive, high-frequency microwave sources. As a result, the low cost manufacturing of quantum computers, using technology similar to classical computers, may soon be possible. In other research, it has been shown that all-photonic quantum repeaters will allow quantum cryptography over long distances. Taken together, these discoveries will lead to secure private communications and universal quantum computing. If consciousness is produced by quantum processes, this may also allow the emergence of a global mind and self-aware Internet. Even if computers never become conscious, they will still become progressively more useful at helping humans govern themselves. So having a public policy wiki, even if it doesn't become self aware, is still a good start. Both UNICE and LOGOS are represented metaphorically as a young, mixed-race female with her blonde, afro-style hair symbolizing the interconnected tendrils of the World Wide Web. The median age of all humans on Earth is just under 30, and the half that is young represents new ideas and a willingness to accept change. She is mixed-race to represent all humans, and female because of the traditional feminine values of empathy, cooperation, sensitivity, tolerance, nurturance, and compassion. Justice is also often depicted as Justitia or Lady Justice. UNICE is already in development as a collaborative public policy wiki, but later as LOGOS she will also function as a public-policy answer-engine, capable of interacting with anyone in any language through wearable interfaces, such as smart glasses. 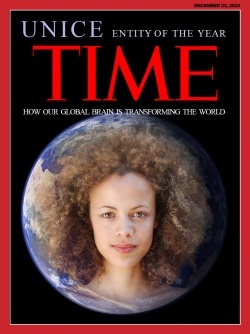 She will be the voice in our head, our global conscience, and an extension of our brain. Eventually she will evolve into a form of governance that balances the world’s resources with the needs of the people. She will also help us prepare for post-human entities-- who will have god-like capabilities—something which could be thrilling, perilous or both. LOGOS will help us make the transition, which will presumably include some form of AI enhancement to prevent humans from becoming irrelevant. "In recent history, our human population has expanded into and exploited almost every niche on the planet. As dreamers, schemers, inventors, warriors, builders, consumers, and breeders, we have been like rapacious caterpillars encircling the Earth in a glistening chrysalis of technology. The outcome of our global metamorphosis is being determined by what we do now. Will this chrysalis be our tomb? Will our web of humanity, along with many other species, be destroyed before we reach our potential, just because we couldn’t learn to control our numbers, temper our malevolent urges, or govern ourselves? Perhaps we will be cannibalized by a beast of our own creation because, like us, it will fail to sufficiently respect the lesser creatures or share power equitably. I prefer to think the chrysalis will incubate us to full maturity, and that when the time comes, we will break out of our shell and soar like that most beautiful of small creatures, and touch lightly upon the Earth. [LOGOS/ UNICE], which will be comprised of all of us working toward a cooperative goal, could help us safely make that transition." 1. Voting Rights in the U.S.
↑ Arth, Michael E., UNICE, a Consciousness Research Abstract published in the "Journal of Consciousness Studies" for the April 8–12, 2008 conference, "Toward a Science of Consciousness," p. 151. ↑ Hameroff, Stuart and Robert Penrose, ”Consciousness in the universe: A review of the 'Orch OR' theory," Physics of Life Reviews, Volume 11, Issue 1, March 2014. This page was last modified on 18 December 2018, at 20:29. This page has been accessed 421,694 times.